From books and magazines, to op-eds and reviews, if the digital onslaught has been responsible for anything, it’s been for delivering a myriad of content. Oftentimes, way too much content, in fact. But where problems lie, solutions normally follow, so here’s a quick snapshot of some of the best apps out there to help you get lost in a world of words. 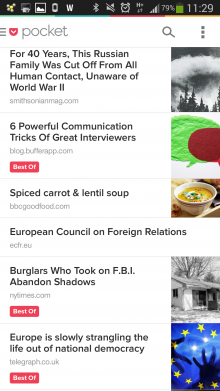 There’s just no getting away from it, Pocket is one of the best apps out there for bookmarking all those articles you never quite get around to reading. Unlike Flipboard, Pocket is all about those articles that you personally want to read – so it’s not automated or curated by any third-party. You can start reading an article in your browser on your laptop, suddenly realize it’s way longer than you anticipated and you have a bus to catch, hit the little Pocket bookmarklet, and it’s saved to your account where you can read it in full later from your mobile device. Alternatively, you can save articles you’re reading directly from your mobile device. On Android, the common browsers will let you share directly to Pocket, while on iOS you can install a little bookmarklet for Safari that lets you save any article, while a slew of third-party apps including Zite, Flipboard and Reeder let you share directly too. Once you’ve synced, all your Pocket articles are available offline, which is great for traveling, and it also saves embedded video in any article to watch in-app – though you will need to be online to enjoy this facet. Besides reading, you can also use Pocket to save anything from recipes to gift ideas – it’s an indispensable service once you start using it. You can read our full hands-on guide here. 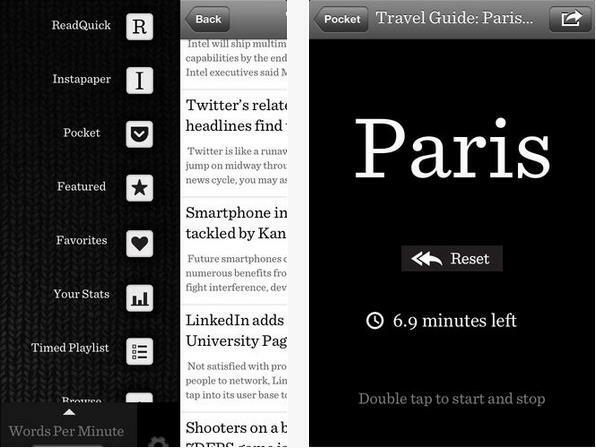 Instapaper is similar to Pocket in many ways, but there are some key differences. Yes, you can save articles from the Web using a browser bookmarklet, and directly from your mobile device too. 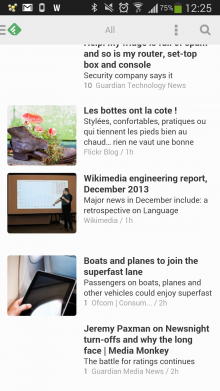 But Instapaper also serves up hand-picked ‘Editors Picks’, which helps surface pieces you may otherwise have missed. 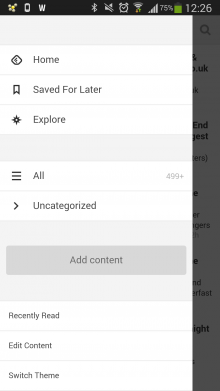 Instapaper offers less third-party app integrations than Pocket, but you can still save content to your account using Android browsers’ built-in ‘share’ option, and mobile Safari. 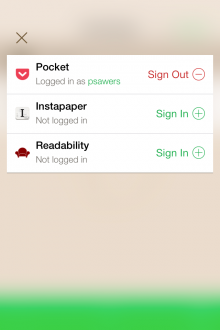 Also, Instapaper has a social layer, letting you follow other Instapaper users and view what they’ve saved. 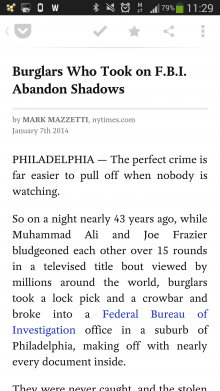 Instapaper is a beautiful app for sure, but it’ll also set you back $2.99 (Android) or $3.99 (iOS). You can read our full hands-on guide here. Readability took its time launching a native mobile app, kicking off with iOS in early 2012, followed by Android shortly after. In a nutshell, Readability clears out all the crap, leaving you with a clean page. 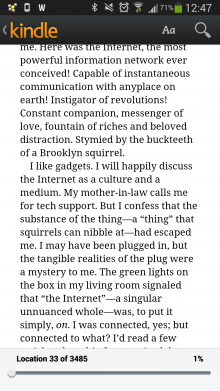 Now, that’s fantastic when reading from your desktop browser, but from a mobile perspective, well, this is pretty much what the likes of Pocket and Instapaper do too. However, Readability does place a lot of focus on design and typography, and there’s little question it’s worth your time. 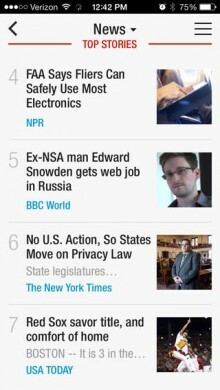 As with Instapaper, it also features a ‘Top Reads’ section that serves up the most popular articles currently on Readability. You can read our full hands-on guide here. For me, e-reader apps are really best used in conjunction with an actual e-reader. I’d rather not read a whole book from my mobile phone or tablet, but it’s a good option if you’re heading into town and don’t want to carry your Kindle with you. So, you can read a chapter or two on the train and then pick up where you left off on your Kindle at home later that night. 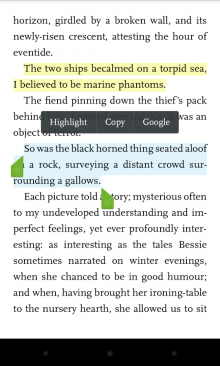 Kindle is a really easy-to-use app, letting you create ‘Collections’ for your reads, buy books directly from your device, highlight text for definitions and more. 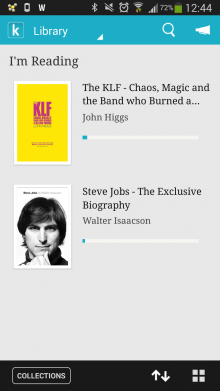 I’m a big fan of Kobo’s e-readers, and its mobile apps don’t disappoint. 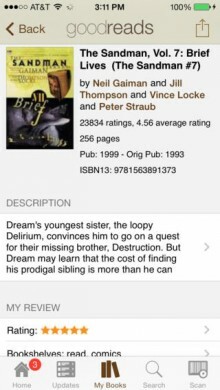 As with Kindle, you can view your library, download previews, highlight text, create collections, and all the rest. 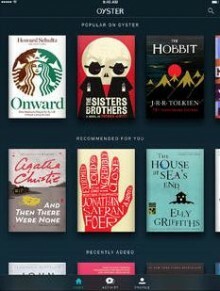 The one thing I’d add about the Kobo app is that navigating the library between books you’ve actually bought, and others that you’ve indicated you’d like to read, isn’t the most intuitive. You have to scroll horizontally between the various sections in the library with nothing on the screen indicating that it does indeed require a sideways scroll. And it always defaults to ‘Want to Read’ rather than ‘I’m Reading’, which is a little annoying. A minor downside for sure, but once you’ve figured it out you really shouldn’t forget how it works if you use the app frequently. It’s certainly not a deal-breaker. Barnes & Noble is a name synonymous with books, and it has been pushing hard to gain ground in the digital realm and reclaim its crown among the readers of the world. The Nook app for iOS and Android is really good actually, and as with its Kindle and Kobo counterparts it lets you sync your reading, change fonts, styles, highlight text, and preview books. There’s not really much more to say. Ultimately, which of the big-three e-reading apps you decide to plump for will be tied in with whatever e-reader you’ve purchased, be it a Kindle, Kobo or Nook. And each of their mobile offerings are decent. Flipboard is the perennially popular news-aggregation magazine app, letting you stipulate your topics of interest and serving you with text-based tidbits accordingly. It covers everything from business and travel, to sports and music. You can also integrate your subscriptions from publications such as the New York Times, and reel in a myriad of websites and RSS feeds manually. It basically blends automation, curation and personalization, and it’s easy to see why it’s proven to be such a popular service. Flipboard also lets you integrate with social networks, such as Instagram, Facebook and Twitter, and you can view all the news your buddies are sharing directly in the app. 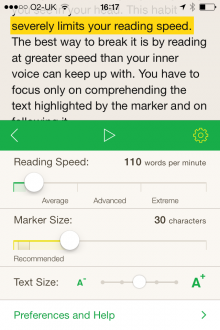 Digital reading platform Readmill optimized its app for iPhone and iPod touch last year, almost a year-and-a-half after it first launched for iPad. And it finally landed on Android just a few months ago too. 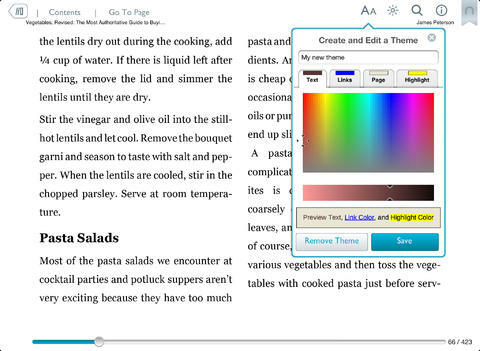 Supporting ePub, PDF and ACSM files (both DRM and DRM free), Readmill serves up a sweet, social way to read, letting you highlight quotes within a book and share these snippets across the social sphere. It also acts as a social network of sorts, letting you ‘follow’ other bookworms, leave reviews and get recommendations once you’ve finished a book. Your whole library is stored in your personal cloud, with the reading experience synchronizing across devices, meaning you can pick up from where you left off last night in bed, while on the train to work. 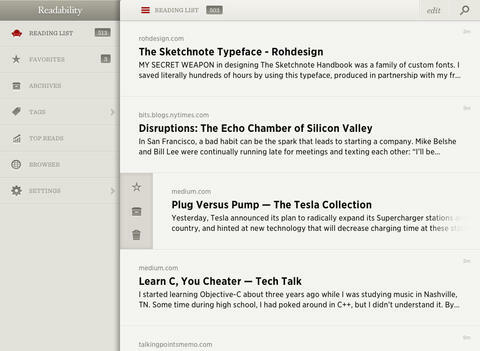 Feedly is the popular RSS app that replaced Google Reader for many, and has really risen to the challenge with an increasingly slick, beautiful cross-platform reading experience. 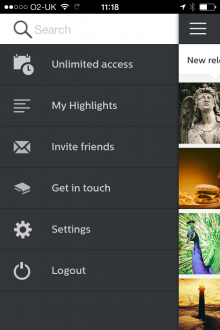 Feedly straddles the gap between Pocket and Flipboard. On the one hand, you manually include the sites, blogs, recipes and podcasts you wish to keep tabs on, but all the content therein is automatically delivered in real-time, sporting a beautiful magazine-like format. It lets you save reads for later too. There’s also a new speed-reading feature that lets users read content faster by tapping the edge of the screen to cycle through new stories, while organizing them as cards to make them easier to read. While Feedly is actively seeking ways to help its users read more quickly, ReadQuick for iPhone, iPad and iPod touch is dedicated to helping you master the art-form by displaying your articles one word at a time. 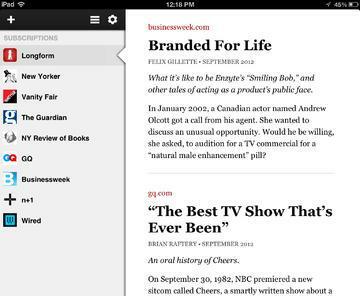 ReadQuick taps Pocket, Readability and Instapaper to display your saved articles – at a pace set by you. It also has a built-in browser that lets you access and save directly to ReadQuick, and tells you how long each article should take to complete based on the stipulated words-per-minute rate. 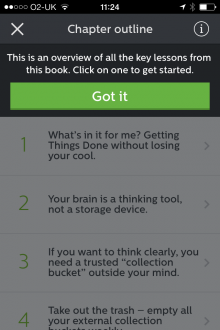 In theory, the more you use the app, the speedier a reader you shall become. 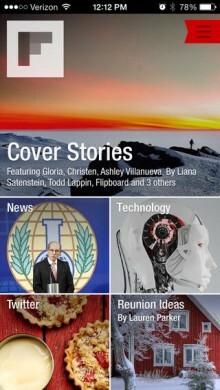 You may also wish to check out Velocity, a very similar app for iPhone that launched recently. Similar to ReadQuick is Outread, which recently entered the fray with its own take on what speed-reading should be all about. 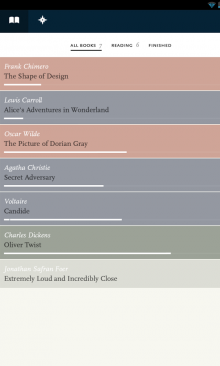 Outread takes a slightly different approach to ReadQuick, however, displaying a full page of text and guiding your eyes by highlighting which part you should be reading at any given moment. Outread also integrates with Pocket, Instapaper and Readability, though you can add any content directly from Safari via the bookmarklet, or you can copy/paste a URL into the app too, or even add your own text – this could be manually typed, though it would be better suited to pasting in a chunk of text from an email or other source. Outread is $2.99, but it isn’t yet optimized for iPad. 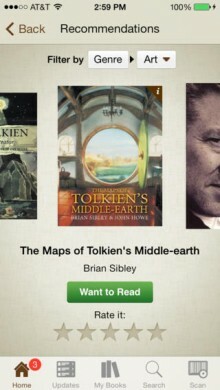 While this app isn’t for reading per se, Goodreads will appeal to anyone who loves a good book. Launched originally in 2007, Goodreads in its simplest form is a social network for books. You can read book reviews and keep a virtual bookshelf of what you’ve already read. You can also search for and review any book on the platform, and pick up ideas for what to read next. There is basic functionality without a Goodreads account, but you’re best signing up to gain access to the full shebang. Oh, and did we mention that Goodreads was acquired by Amazon last year? Oyster can best be described as like Netflix…but for books. 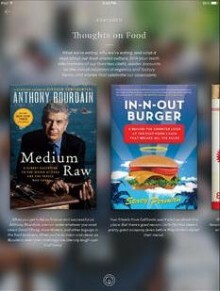 The all-you-can-read subscription service arrived for iPad in October, one month after launching on iPhone. The service costs $9.95 a month, and gives users unlimited access to its catalog containing more than 100,000 books. Unfortunately, Oyster remains both US AND iOS-only for now, but it’s an interesting initiative nonetheless, one that perhaps gives a glimpse into the future of e-reading. That said, it’s best suited for heavy-readers who could get a lot of value from this. It’s a veritable library in your pocket. 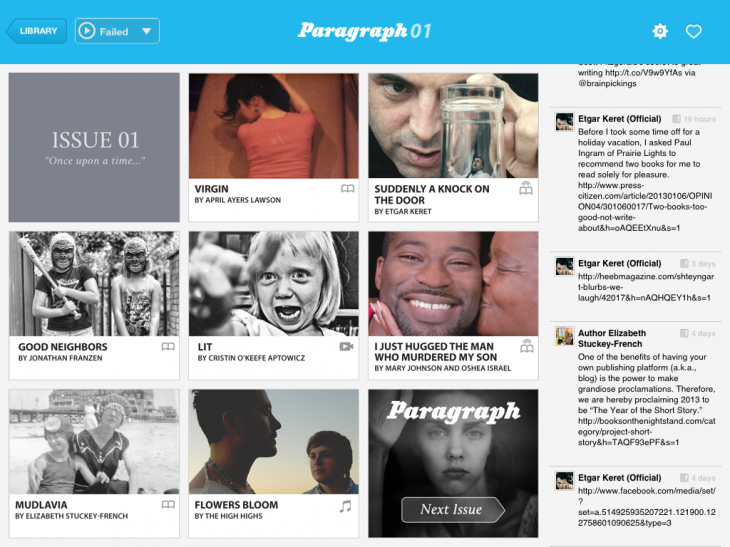 Paragraph Shorts is a curated iPad magazine, serving up a selection of hand-picked short stories in text, audio and video. Each week, the guys at Paragraph Shorts select stories from the likes of The Paris Review, The New Yorker, The Moth, The Guardian and others, and present them in a beautiful magazine for the public’s consumption. And it’s completely free too. Longform isn’t too dissimilar to Paragraph Shorts, except it feeds in content on a daily basis across a much broader range of publications. 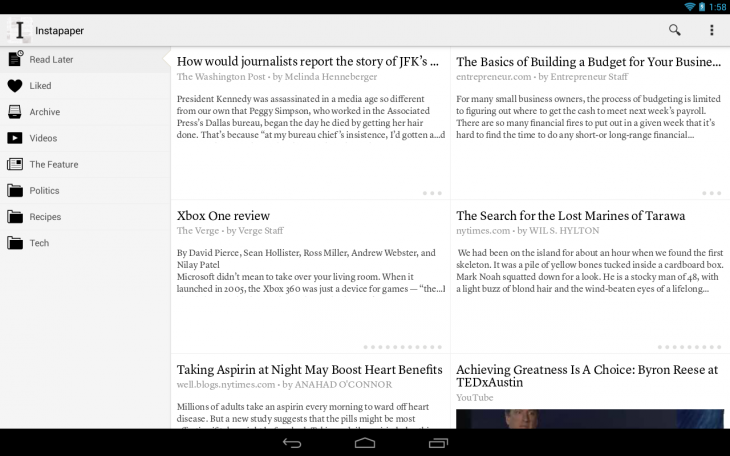 It also lets you save articles to read later in Pocket, Readability or Instapaper. 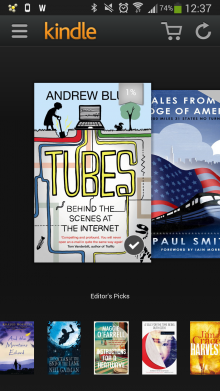 Longform will set you back a flat $2.99, after which you gain full unrestricted access. While services such as ReadQuick and Outread are designed to train your eyes to speed-read, Blinkist lets you get to grips with entire non-fiction books in fifteen minutes. But this isn’t about teaching you how to read like Superman. No, it’s more about curation and condensing – pure human brainpower and field experts with a passion for explaining complex matters is the name of the game here. The platform still only counts 152 books at the time of writing – 80 in English and 106 in German, though some are in both languages (hence only 152). But the company’s adding, on average, 20 books a month, and they are starting to ramp up efforts to increase the book-count. To give you an idea of what kind of books you can read in 15 minutes, there’s everything from Popular Science and Business & Career, to Entrepreneurship and Health & Happiness. In terms of specific titles, there’s Richard Dawkins’ The Greatest Show on Earth, Barack Obama’s The Audacity of Hope, and the 2005 classic Freakonomics, from University of Chicago economist Steven Levitt and New York Times journalist Stephen J. Dubner. Once you’ve found the book you wish to read, click, and you’ll see a series of chapters condensed into around 250 words each. 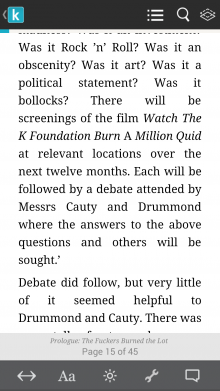 Then there’s a ‘Final Summary’ chapter that basically sums up the key points from the whole book. Following a free trial period, you’ll be asked to pay €4.49 ($4.99) a month, or save a little cash by agreeing to sign-up for a year and pay €44.90 ($49.99) in total. An iPad and Android-optimized version should be arriving this year.